Contact Animal control | Got Barking? Have you or anyone you know had a problem with nuisance dog barking (dog owners and neighbors)? Is Your Neighbor´s Dog Affecting Your Quality Of Life? Before contacting Animal Control to file a formal complaint of nuisance barking, it is recommended that you contact the dog owner first. 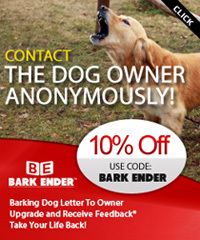 Bark Ender™ provides you the opportunity to contact the dog owner anonymously. Visit Bark Ender™ for more information. Dog Owners Click Here for bark control information. “Your City or County, and state” Animal Control. If you do not get any results, then you may have to contact your local police or sheriff’s department. Some states have a Dog Warden that handles barking issues.